*Alternative title: “Why it never makes financial sense to buy a gas car again” — but that’s not as pretty a headline. As many of you know, my Odyssey was at the shop last week. The first mechanic was an utter waste and had a very illegal looking place with box fans used as ventilation. He had a fit when I asked him if he had checked my car. He said I was badgering him. Yes, that would be two unanswered phone calls and one text message over three days. He asked me to pick it up the same day. That’s what I did. I didn’t trust him after his tantrum. Three days were wasted for repair. I was lucky a friend recommended a second mechanic who was excellent. It seems the engine was misfiring. The mechanic installed new spark plugs, did a fuel injection service, and cleaned up some wires and a bunch of other things I don’t remember. The repair cost $500 plus $200 to rent a Toyota Prius on Turo. I got started on CleanTechnica with a detailed numerical analysis. I went back to my roots. My wife (also known as Significant Other) wanted to see how much a similar 8-seat vehicle would cost. Her thought was the minivan comes in handy when we have family or company visiting. Subarus have excellent safety ratings and excellent depreciation compared to the competition. The Ascent Premium Trim was my comparison vehicle. I was torn between lower payments and a lower term. I decided on a lower term, and I will show why later on. Let’s make two things clear. If you ever plan to buy a Model 3, it makes more financial sense to buy it with the US tax credit in place. Once you decide to buy, get a loan from a credit union (not a fossil fuel funding big bank). Credit unions are owned by their depositors. Many will work with you if you have poor credit history. Their flexibility and lower interest rates make it easy to choose a credit union over a bank for a loan. Currently, we fill up my Odyssey three times a month. With a 20 gallon tank and gas close to $2.50 a gallon, the cost is $150 a month. Based on the repair bill for the last four months, I thought $150 a month for the next 10 years was a reasonable cost for maintenance and repairs. You will notice that the price of all four vehicles have similar payments with a 72 month term. Whichever vehicle we buy or hold onto, our timeframe is to own it for the next 10 years. Below is how that looks like in chart form. Negative numbers are down payments / monthly payments and positive numbers are savings from having no car payment / US federal tax credit. Chart 1: These are some interesting months at a glance. 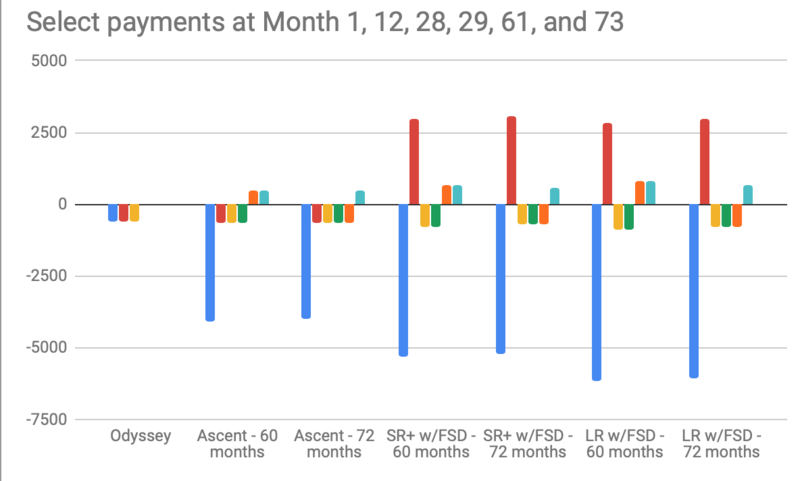 Month 1 (blue bar) is the downpayment plus first payment, 12 (red bar) is when we receive the tax credit, 61 and 73 (last two bars) are when the loans are paid off. You will see there is a large spike higher at month 12 (red bar). That’s when we file our tax returns in April of next year and redeem the US federal tax credit for purchasing an EV. Month 28 is when we pay off our Odyssey. In month 29, we save $327 for the Odyssey car payment but only save $27 a month (still pay $150 for gas and $150 for maintenance). Month 61 we are free and clear on our five-year car loan, but still have to pay fuel and maintenance costs. Month 73 we are free and clear on our six-year car loan and save the difference. To make things fairer, assume we pay $100 a month in maintenance and fuel for any Model 3 we buy after the car is paid off. It doesn’t change the results at all, and I think that’s high. Zach had a good rundown on cost comparisons last month, so the result probably won’t surprise you. The winner is … Tesla Model 3 SR+ w/FSD! Chart 2: All the 60-month loans are cheaper than the Odyssey. Surprising even to me, the Teslas have a lower NPV than the Subaru, even though they cost much more. 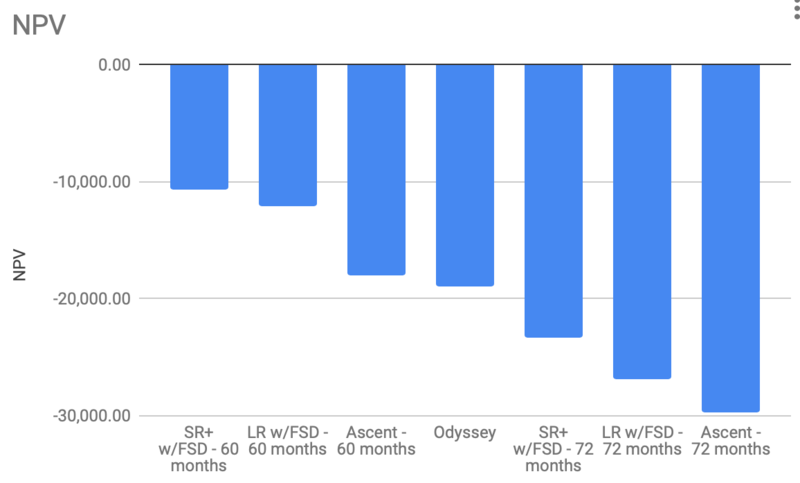 All 72-month loans are more expensive than the Odyssey. The final results shocked me. Due to the lower fuel and maintenance costs of a Tesla vehicle, we save a majority of the monthly payment after paying off the car. This dramatically reduces the total NPV. I was initially leaning towards the 72 month payment, but having to pay $777 for one extra year versus saving $677 for that extra year makes a huge difference in the NPV calculations. The difference between the SR+ and LR NPV at 60 months was approximately $1,400. Given the greater feature set of the LR (greater range, faster charging, Premium interior, live satellite maps), I decided that the LR made more sense for us. It is definitely a Tesla stretch, by far the most we will pay for a car. The extra range enables two features that are not obvious at first glance. With the greater range, we can take longer car trips rather than flying. We only need to use the LR for 5 trips with our family of four at $250 / ticket, or 10 trips at $125 / ticket, over 10 years for us to save $5,000 over flying. 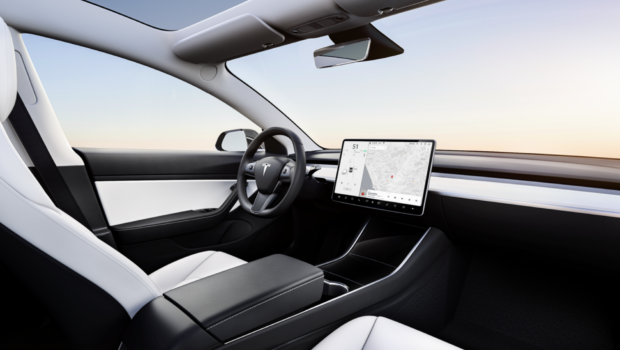 The second feature is the Tesla Autonomous Network. We will find out more on April 19th. With the greater range, the LR will complete more trips during a single day, earning us more money. The combined safety, cool factor, and earnings potential of FSD guided us to choose that option. We would only need to earn $1,000/yr for five years, or $2.75 a day, to put another $5,000 in our pockets. I have good things to say about the SR+ w/EAP or FSD option. Anyone buying this is smart. You save on monthly payments, lower down payment, same size tax credit, and enjoy many of the same benefits as the LR. If the numbers weren’t so close, the SR+ w/FSD would have been our #1 choice. With the price change as of April 12th, this combination is cheaper than it was. This low NPV makes all-electric cars and particularly the Model 3 instantly comparable to much cheaper gas cars. As a comparison, I looked at a base Toyota Corolla. I estimated $291 in payments over 60 months, $75 in gas, and $75 in maintenance every month. After month 60, my savings were $141 a month. My NPV was -$18,652, which is well above the Model 3 and very close to my 6-year old Odyssey. Run away! This explains very well why the Model 3 is drawing customers from segments that it has no business competing in based solely on starting price. This is why I state with my * above it won’t make sense for us to ever buy a gas car again, even before we drive the Model 3. Update: Tesla’s LR RWD is no longer available on the website as of April 12, 2019. A call to Tesla Sales confirmed the LR RWD is no longer available at all in the US. Tesla’s SR+ now includes EAP. I was looking to purchase a SR+ w/FSD, so that part of the analysis stays the same. Disclaimer: I currently own Tesla shares. I think $TSLAQQ people and bots have a severe problem with facts and logic, not to mention antisocial attitudes, and they are generally people I actively try to avoid. This article is my opinion and is not meant to be investment or financial advice. Please see a properly licensed financial advisor to discuss investments. Follow me on Twitter @vijaygovindan17.